Alexander Stevenson was born in Hamilton in 1892, a son of baker William Tyson Stevenson and Euphemia Evangeline Heazlewood. William and Euphemia, who married in 1888, were from Portland but Euphemia’s family links to Hamilton went back to the first settlers. Euphemia was the daughter of William Heazlewood born in Hamilton, then called The Grange, in 1844 and said to be the first European child born at The Grange. Alexander was known by all as Lex. He attended Hamilton State School but he also had some time in Portland spending two years with the Naval Brigade in Portland. He was there in 1908, when he and his younger brother Edgar gave recitations at the Women’s Christian Temperance Union Anniversary at the Portland Baptist Church. On 2 October 1914, the Hamilton Spectator wrote that Lex had volunteered. He went off to Broadmeadows for training and in his absence, on 19 November 1914, the Hamilton Baptist Church held a send of for him and Robert Stuchbery. William Stevenson accepted a gift of a wrist watch on Lex’s behalf. After 108 days, Lex was discharged from the army as medically unfit. He returned to Hamilton and his job as a baker in early 1915. Life went on for Lex during that year and he participated in various activities around the town. He was a member of the Hamilton Miniature Rifle Club and Hamilton Rifle Club and competed successfully being one the better shots of both rifle clubs. In March 1915, the Rifle Club formed a Rifle Club Corp and Lex joined. He was a Section Commander under the charge of Sergeant Major Corbett. “Advertising.” Hamilton Spectator (Vic. : 1870 – 1873; 1914 – 1918) 15 Mar 1915 <http://nla.gov.au/nla.news-article119837613&gt;. Lex and younger brother Edgar Richmond Stevenson did a lot together. They were members of the Independent Order of Rechabites (IOR) and they enjoyed singing. They each sang solos at the IOR fortnightly meeting as reported in the Hamilton Spectator of 27 January 1916. However, despite keeping busy, Lex wasn’t finished with the idea of fighting for his King and country and the two brothers most likely spoke together of their desire to serve. Lex underwent a medical examination in Hamilton on 15 February 1916 and on 19 May 1916 enlisted at Ballarat with the newly formed 39th Battalion. By the end of the month, he was aboard the HMAT A11 Ascanius with the 39th Battalion bound for England. At home, Edgar was enlisting as Lex was sailing. Lex arrived with the 39th Battalion in England on 18 July 1916 for training at Salisbury Downs. He was soon promoted to Lance Corporal. Edgar arrived at Salisbury Downs on 1 November, having sailed with the 39th Battalion 2nd Reinforcements. They hadn’t seen each other for six months. A promotion to Corporal came for Lex on 17 November. The time came for the 39th Battalion to begin the move to France. Lex was first of the brothers to leave on 23 November 1916 and Edgar arrived on 21 December. It was during December that Lex fell ill with mumps and didn’t return to his battalion until 13 January 1917. He was granted two weeks leave at the beginning of May. On 13 June 1917, Lex received another promotion to Temporary Sergeant and Sergeant on 13 September. The winter of 1916/1917 saw record rainfall at Flanders, particularly during August and there was further heavy rain for several days from the 4 October. Men were up to their waists in mud. If Lex wasn’t already down about the dire conditions he found himself in, he buried his beloved brother Edgar on 4 October. Edgar was killed during the Battle of Broodseinde. To dig your brother’s grave is a unthinkable task for anyone but so far from Hamilton and family, and the endless mud must have made it a huge burden for Lex to bear. 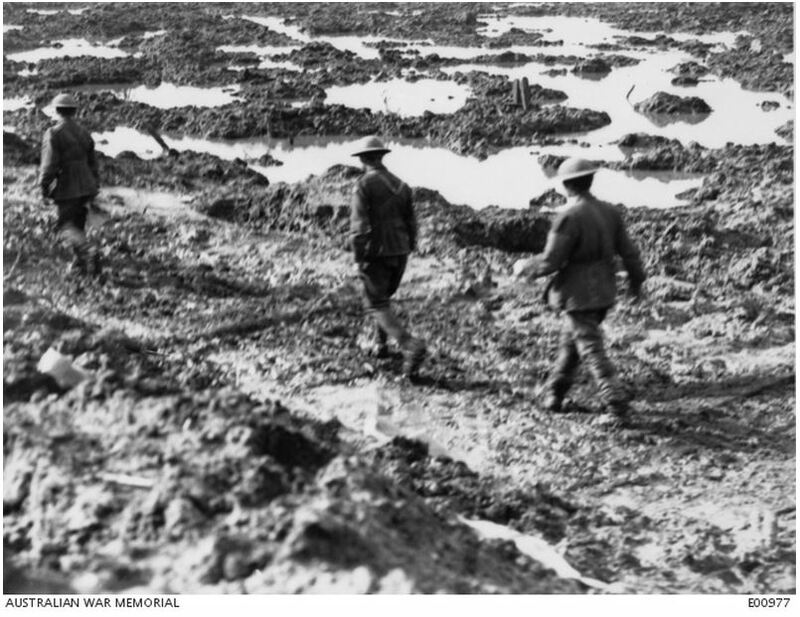 At 10:00pm on 11 October, the 39th Battalion, began to march into their next battle, that would become known as the First Battle of Passchendaele. More rain had fallen in the days before and the dark, slippery conditions saw a march that normally would take one hour turn into five hours. The aim was take the village of Passchendaele, but from the time the allies moved forward at 5:25am on 12 October, pouring rain, mud, exhaustion from the long march and a better positioned enemy made the task impossible. During that time, Lex received a gunshot wound to the back and left arm. The 11th Australian Field Ambulance cared for Lex at their dressing station near Red Farm before admitting him to the 44th Casualty Clearing Station at Nine Elms. Sadly, his severe wounds led to his death on 15 October and he was buried at the Nine Elms British Cemetery. Lex’s wounds came just eight days after and within three kilometres from where he buried Edgar. Back in Hamilton, William and Euphemia heard the news about Edgar around 25 October 1917. As if their grief could not reach greater depths, around 31 October, they heard Lex was also dead. They received much support from the Hamilton community, empathetic to the parents who had lost two sons in such a short space of time. “Family Notices.” Hamilton Spectator (Vic. : 1870 – 1873; 1914 – 1918) 24 Nov 1917: 7. <http://nla.gov.au/nla.news-article119859798&gt;. 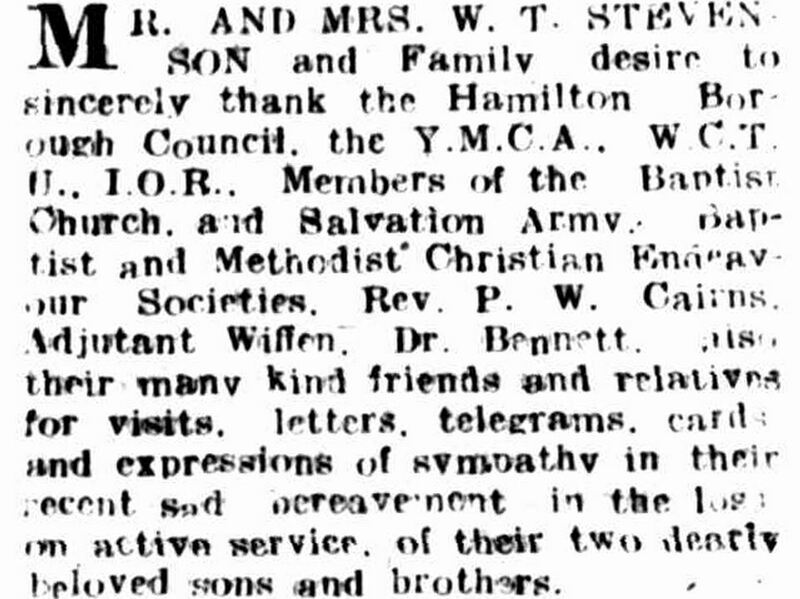 The evening Sunday service at the Hamilton Baptist Church on 11 November 1917, was a memorial service for Lex and Edgar. Both were keen church goers and it was right to remember the two men who had brought much joy with their singing. The church later unveiled memorial windows for Lex and Edgar. 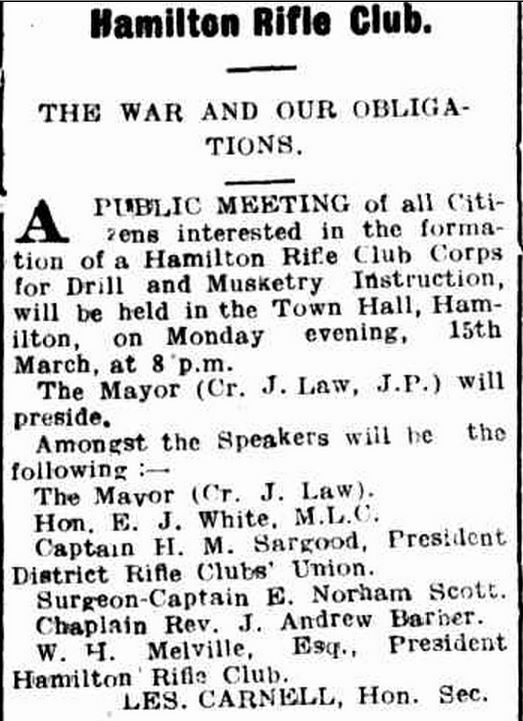 Lex was remembered at the Hamilton Rifle Club Annual meeting in 1918. 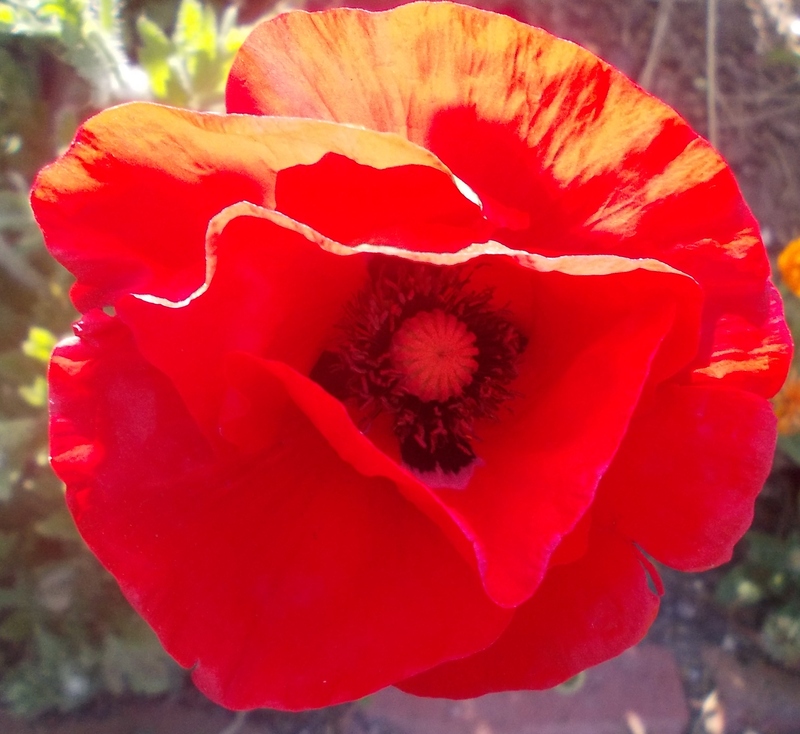 He had been an active member of the club and he joined a list of members who had paid the ultimate sacrifice. In the same year, a tree was planted along Hamilton’s Anzac Avenue and his name is on the Hamilton War Memorial just above the name of his brother. During July 1918, William and Euphemia Stevenson received a letter from Captain Douglas Middleton of the 39th Battalion. Published in part in the Hamilton Spectator of 16 July 1918, Captain Middleton expressed his sympathy to the Stevenson family and revealed he had recommended Lex for decoration “because his work was splendid”. On March 26, 1936, Euphemia wrote a letter to the Adjutant General, telling him of the letter she received from Captain Middleton almost twenty years before, and his recommendation. Prompting her letter was the book “The Thirty-Ninth” by Lieutenant Colonel Paterson published in 1934. The Nominal Roll and Index in the book included those recommended for medals. Among them, Alexander John Stevenson. Euphemia had seen that reference, reminding her of Captain’s Middleton’s letter. Unfortunately the reply from Base Records was that it was a recommendation only and no medal was forthcoming.